Grease standard sized muffin tins. Mix all ingredients very well with a stand mixer. Evenly divide batter into 24 muffins. Bake for 30 minutes. Keep an eye on them in case they start to burn. Each muffin acts as one ounce of electrolytes. Omg, those look super yummy (even for people, hahah!). Ooo those look good, thanks for sharing! 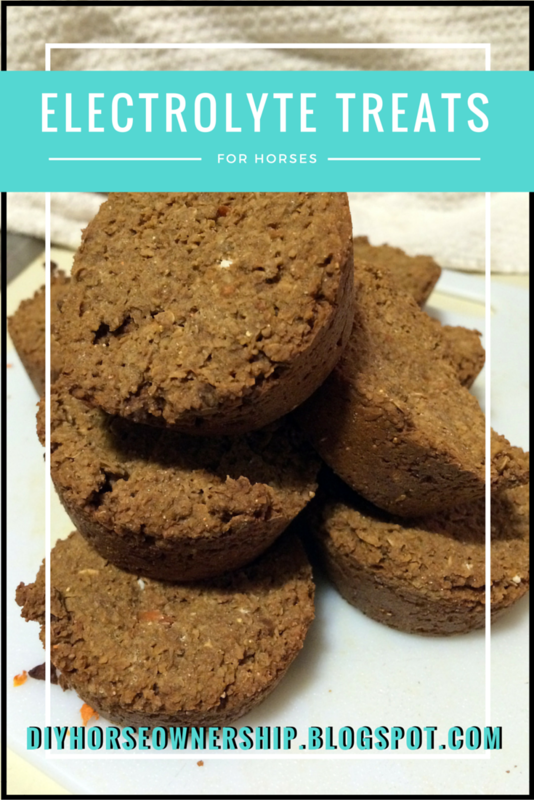 They do look good, but my horse electrolytes are not approved for human consumption so I'd check that before eating any if you make them. Plus, they probably taste like salt. Nice! How many do you usually feed post-ride? I actually packed them in my saddle bags and used them along the way on the ride. Pre and post-ride I add electrolytes to her beet pulp and so long as she'll eat that I don't mess with her. But I can't do that during a ride. Some endurance riders use paste (like wormer tubes) but Nilla hates being dosed like that so I had to find another way to get her eating them. Your site is really cool! Would you be interested in swapping links to each other's blogs and displaying them on our respective sites?